Date: 24th - 26th March 2007. Location: Dome Center, Henrietta, Rochester, NY,USA 14467. 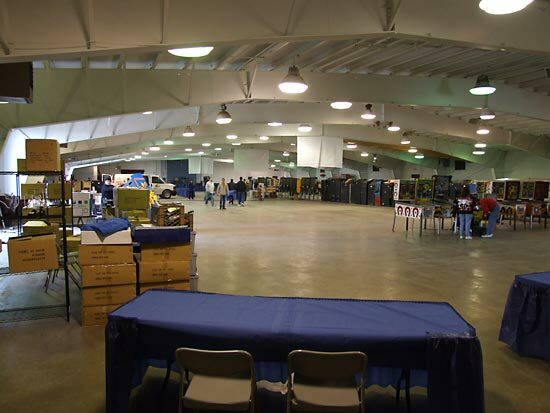 This was the second year for the Rochester Gameroom Show and once again it took place in the Minnett Hall of the Dome Center in Henrietta, a southern rural suburb of Rochester. The Minnett Hall is a high-roofed building at the rear of the Dome Center and at the time of the show some construction work was taking place on the main Dome Center to create a better entrance to both venues. 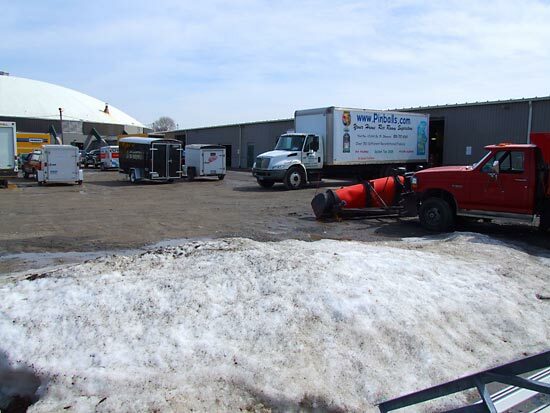 That work, combined with the melting snow from the recent fall, created some wet and muddy conditions in the parking lot. 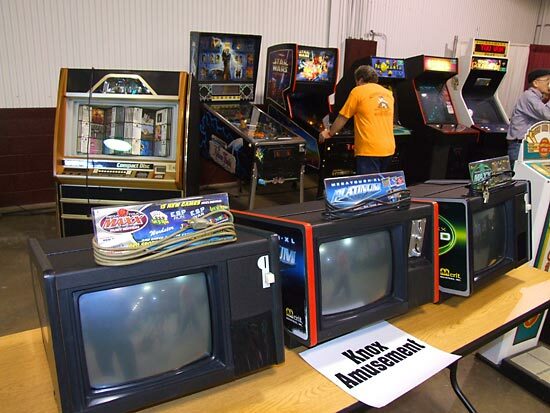 Last year's show occupied about 60% of the available space with a curtain blocking off the unused area, but this year there were enough games and stands to use all the 23,000 square feet of floor area. 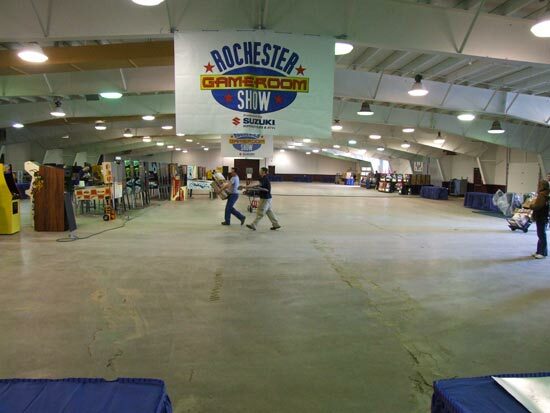 We were at the Rochester Gameroom Show for the set up and opening session on Friday to see the transformation from an empty hall to a full one, ready for the first night's opening to the public at 5pm. The show continued through Saturday and Sunday but because the Texas Pinball Festival was taking place the same weekend, we could only be at Rochester on the first day. 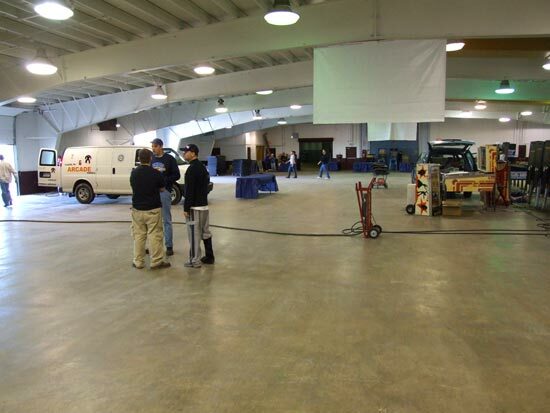 The hall features three large loading doors allowing all but the tallest trucks to drive inside and unload their contents simplifying the set up process. 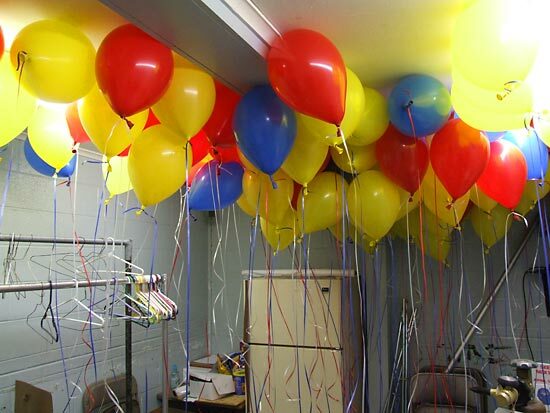 In the back room, last minute prepararions were underway and balloons were being inflated to add to the atmosphere in the hall., where the tournament games were being assembled ready for the start of the qualifying rounds later in the day. 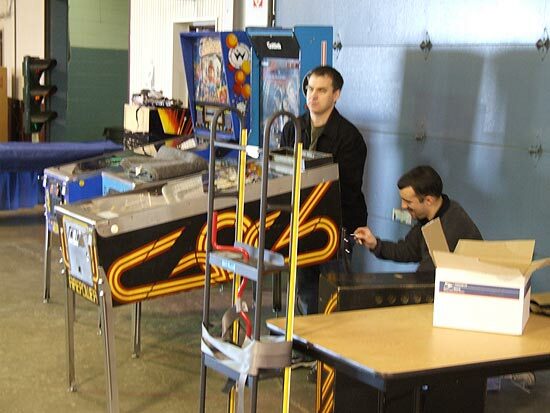 Brian Smith from P3Tournaments was in charge of the competitive side of pinball playing at the show, featuring the Wizard Of New York tournament in which 26 players completed 66 entries to try to get their hands on the title and the cash prizes. There were also a beginners division and a kids competition too. 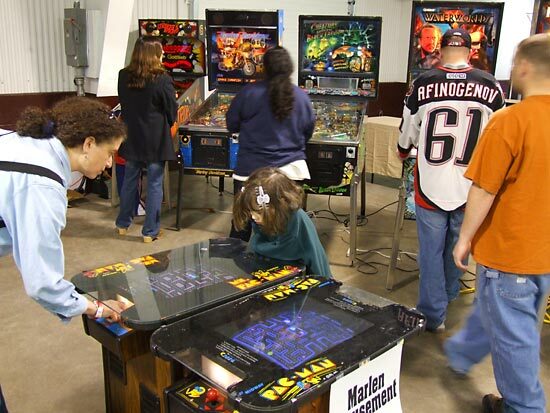 Players in the Wizard Of New York tournament competed on any three of the four games - Attack From Mars, Firepower, Star Trek - The Next Generation and The Addams Family - and their score on each game was ranked against other scores to give a maximum of 100 ranking points for the highest score, 95 for the second, 90 for the third, 89 for fourth and then so on for all subsequent positions. The total points across all 3 games is then added up and the final qualifying score produced. 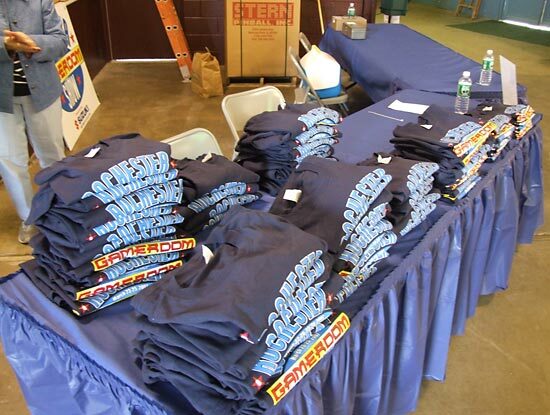 Players could buy multiple attempts but it was only their full three-game score that counted each time. When qualifying ended, the top eight scorers went on to the final rounds where a double elimination format decided the winner and runners-up. The winner was Eric Bentsen who beat John Flitton into second place, with Steven Bowden coming third. The highest scoring qualifier was Maurice Pelletier who received a plaque for his skill. 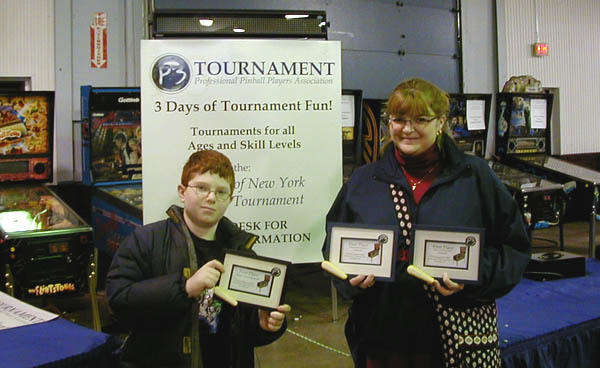 The Kid's Division was won by Josh Schaeffer while the Beginner's Division went to Lynnea Fugh. Congratulations to them both. 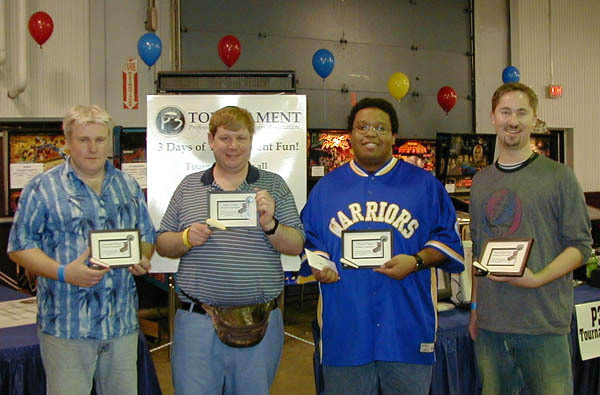 A full list of results and more details about the tournament formats can be found at the P3Tournament website, who provided the winner pictures above in our absence. Aside from the tournament, there was also a prize to be won from the show's sponsors Suzuki Motorcycles & ATVs. 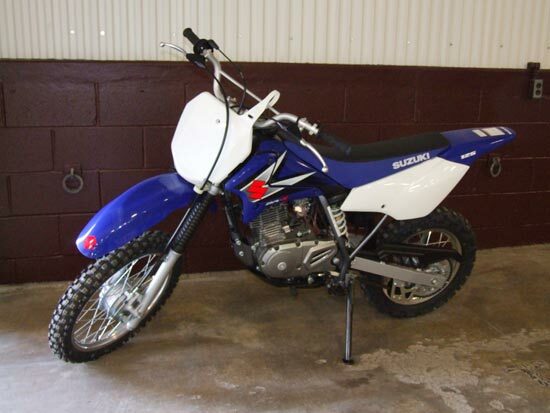 A bike just like the one below was the prize in a free draw for all visitors. 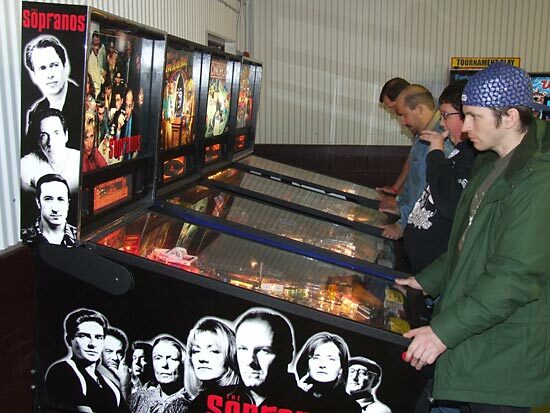 Fans hoping to play the newest games were not disappointed thanks to Pinballs.com and their selection of new Stern games such as Ripley's, Sopranos, Monopoly, Grand Prix, Family Guy and UltraPin (shown below). And there was the new remake of King of Diamonds on display for visitors to play and see how it compared to the original and to today's modern games. *Those games marked with an asterisk were set up but not powered and working. The list was made Friday evening and includes those games available for general play. Private games not set up for public play are not included. 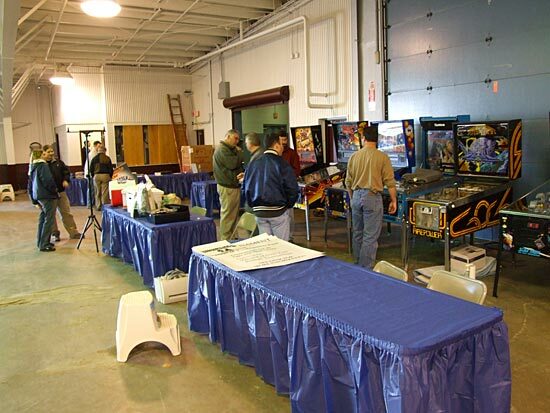 With the pinball and video games in the centre of the hall, the vendors and the tournament fitted around the outer walls. 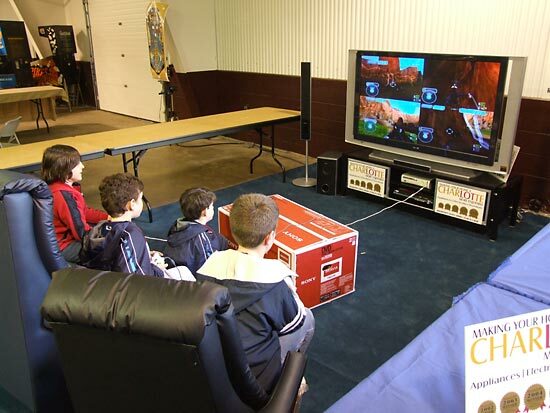 Kids who were reluctant to leave their home found a welcome alternative at the show with Charlotte Furniture & Appliance's 4-player X-Box 360, large screen, surround sound demonstration area. show just to sell as fixer-uppers. The vast majority though were in good condition with some very nice examples amongst them from the restoration companies. On Friday evening there were power problems which resulted in regular outages to several banks of games. I understand a thorough review of the power connections and load distributions was going to take place late Friday night so hopefully that sorted out the problems for the rest of the weekend. Certainly, I didn't hear any complaints from Saturday's visitors. So, a succesful second Rochester Gameroom Show for Dave Jones and the whole show crew. Congratulations to them and the P3 team for the tournaments this year. 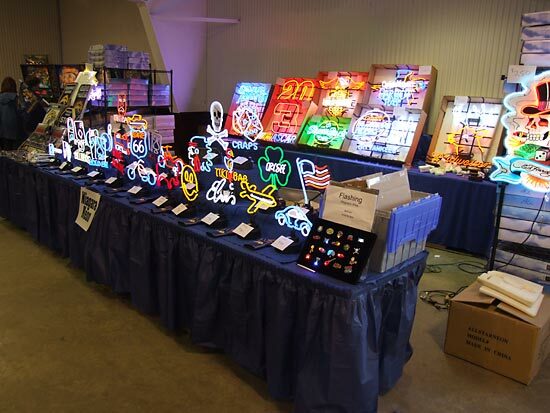 With the building work completed, no clash with the Texas show and the same level of support from exhibitors and vendors, next year should be even bigger and better. Quite a prospect. 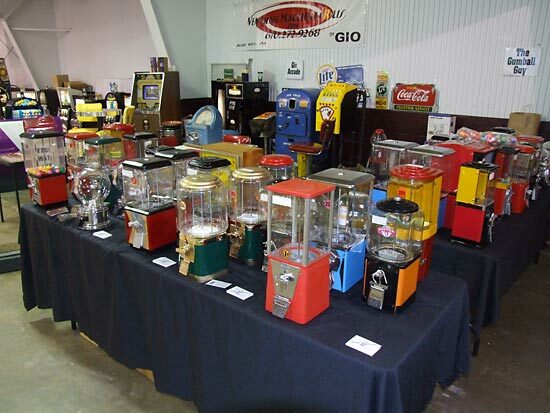 After much research, the hotel chosen for the visit to the show was the Best Western Marketplace, a very short drive from the show with good facilities, friendly staff and well furnished rooms. They provide plenty of complimentary snacks and coffee on arrival - even late at night - and have a well stocked breakfast buffet included in the room price. If you're leaving very early before the breakfast starts - like I was - they'll even make you up a breakfast bag for you to take with you. 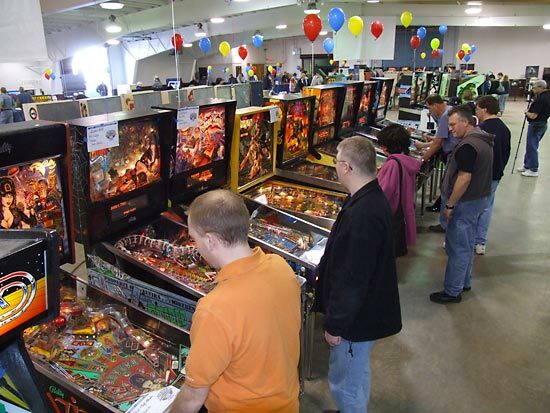 You've read about the show but now you can see it for yourself with our exclusive Pinball News Two Minute Tour. 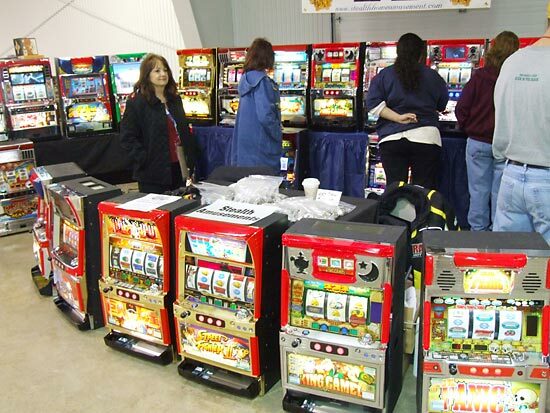 Simply click on the play button below for a walk around the show floor.